Whether applying adhesive in the studio for mock-ups, story boards, or comps, The Xyron Pro 1255 instantly applies adhesive without heat or electricity. Simply feed an item in, turn the handle and trim. No smell, no mess, no waiting. The patented drop-in cartridges allow users to quickly switch between applications, making the Xyron Pro 1255 the most versatile machine on the block. It's improved adhesive aggressiveness, couples with high pressure rollers, improves both transfer and bonding quality. 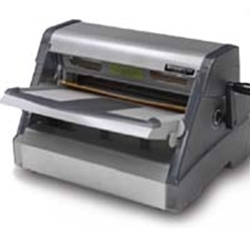 Whether applying adhesive in the studio for mock-ups, story boards, or comps, The Xyron Pro 1255 12" cold roll laminator instantly applies adhesive without heat or electricity. Simply feed an item in, turn the handle and trim. No smell, no mess, no waiting. The patented drop-in cartridges allow users to quickly switch between applications, making the Xyron Pro 1255 the most versatile machine on the block. It's improved adhesive aggressiveness, couples with high pressure rollers, improves both transfer and bonding quality. Works properly,not noisy, lovely really.